This player does not have all the characteristics specified in the article on The use of modern techniques to improve cylinder playing. But it has the essential features, especially those related to playing by tangential arm. A turntable with a tangential arm and a magnetic stereo pickup is the best solution to the problem. So that is what I have used when building the player. The player consists of several modules, each with its specific function. 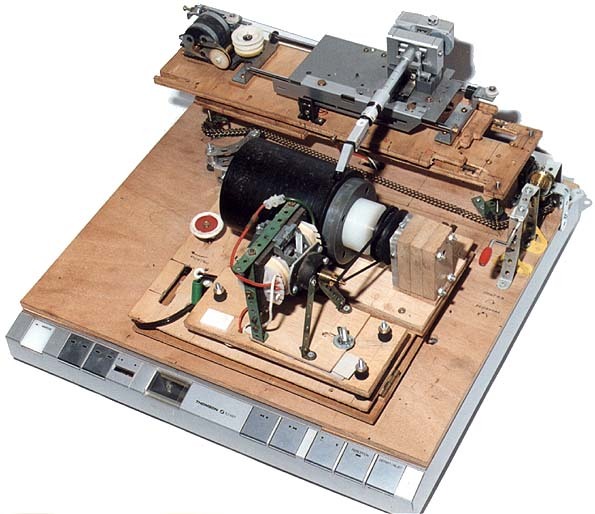 The base board, on which the whole system is mounted, comes from a Thomson TLT 542T turntable with a tangential arm. It contains the circuit board for guiding the arm, and on the front I have kept the controls. The motor circuit board and the motor itself have been removed. The base board is covered by a piece of plywood on which the different parts of the player are mounted. - a small servo motor that moves the arm by a system of chain and pulleys. - laterally by sliding the upper plate over the lower one, making it possible to start playing the cylinder positioning the arm at the beginning of the recording, thus compensating the rigidity of the original system which plays 17 and 30 cm discs. - vertically, to adjust to cylinders of different diameters and to keep the pickup on the very top of the cylinder. This movement is achieved by four screws, fixed vertically at the four corners of the lower plate and synchronized by a chain and pinions. The device is built of Meccano parts and is maneuvered by a crank. This system has the added advantage of permitting adjustment of the horizontality of the slideways that guide the arm's lateral movement, an important condition to assure a good functionality when playing the cylinder. - The cylinder support, a polypropylene mandrel on a steel shaft mounted in ball bearings. - A Perpetuum Ebner 220 volts turntable motor, with its original shaft for the three normal speeds (33, 45 and 78 rpm). The motor is mounted on a moving plate and is insulated by Silentblocs. The mandrel is belt driven. As the motor does not have electronic speed control, one of the steps on the shaft has been dimensioned to obtain a speed at the cylinder of 160 rpm. The speed can be changed by moving the belt to another step on the motor shaft. This is made easy by the mobility of the motor support plate. - front to back, to compensate for the different lengths of the headshells that can be put on the arm and to assure that the stylus is located straight above the mandrel axis. - by rotation around an axis prependicular to that of the cylinder to change the slope (that is, the horizontality) of the mandrel axis. Optimum inclination of the cylinder is one of the conditions for the system to work well. Playing a cylinder on a conventional player is fairly easy, but a lot more complicated on this player. A good sound retrieval requires several attempts as well as both practical skill and theroretic knowledge. First and foremost: the quality of the cylinder. In simply playing, aside from any digital processing, we can never get anyhting good from a cylinder covered with mould, with traces of blows, cracked or worn by too brutal or frequent handling. Proceeding to digital processing will bring some improvement (for instance, elimination of clicks from a scratch) but will never let ur hear Sarah Bernhardt read Racine if the cylinder she recorded more than a century ago is white with mould. The information has been destroyed by the fungi and no longer exists. The stylus. This parameter, as in the case of conventional discs, is very important and must be regarded together with another fundamental parameter: the stylus pressure on the groove. There again we depend on the quality of the cylinder and the characteristics of the recording, especially the depth and width of the groove. It is desirable to try out styli with different diameters, generally spherical ones, the diameters of which may vary between 0,2 and 1 millimeter, and to combine them with different stylus pressures. It is also advisable to slightly change the stylus position along the groove. The effect of this is to change the angle between the stylus and the tangent at the point of contact with the groove. The effect of these small displacements are far from negligible and are clearly evident to the ear. The last parameter to have in mind is the rotational speed of the cylinder. This parameter is very difficult to master, because recording speeds were not constant, not within the same brand, and not even for the same title. The solution chosen here does not involve the player. It could really be any speed (160 rpm to give an idea), for it will be corrected digitally during sound processing. Once the adjustments and test runs are made, the cylinder is played by the player and the stereo signal is digitized and recorded directly on the hard drive of a computer.